Niwatsukino Norihiro's 'Suffering Of Ninko' is about sexual awakenings. 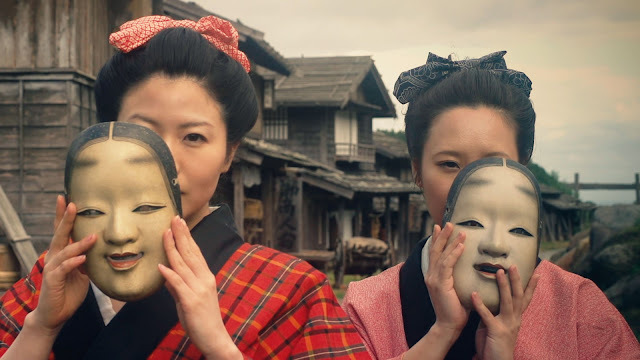 A surreal, ghostly folklore and an absolutely batshit crazy mix of live action set course with exquisite animation that represents various styles of Japanese Art in the most perverse ways. Enmeiji temple is a shrine for Buddhist monks. The supreme master has been training all the young monks to gain ultimate virtue towards the world. Ninko (Masato Tsujioka), on the other hand, is unable to attain this ultimate nirvana when he is a constant centre of attraction for all the women (and even a few homosexual men) who are attracted to him like flies. Ninko tries his best to meditate and complete his training to be a monk, but he is being constantly allured by the thought of naked breasts and beautiful women all craving for his bodily pleasures. An encounter with a strange faceless woman in the woods only enhances his thoughts, as he starts having a secluded vision of him eluding away from women, trying very hard to resist his sexual urges. 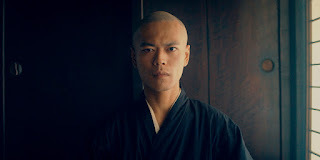 Norihiro's film is narrated by Qyoko Kudo, who makes the film sound like one of those Buddhist stories that explores the meaning of life and onself. Strangely so, Ninko's life is nothing more than a bewildering array of things he doesn't understand. He wishes to complete his training of being a monk and yet he doesn't understand himself. As Ninko's suffering enhances, he decides to take a journey to the mountains, where he stumbles onto a samurai and also a seductress straight out of Japenese ghost-tales. There's a clever use of 70s sexplotation troops, which is quite evident from the occasional over-the-top background score. Soon enough, the film merges into surreal oddities and trippy visuals that, at times, are really hard to get behind. While this partly crowd-founded debut feature boasts an impressive blend of storytelling, where Norihiro doesn't stick to one specific genre and builds it up in a way that leaves you astonished, it doesn't always make sense. For instance, the third act is filled with a dark tone that hints towards a man falling to the dark side while the whole journey previously initiated seemed to be about a man running away from his desires and fears. This element made me wonder what were Norihiro's intentions towards Ninko. An experimental film like this one doesn't really have to explain it to the viewers, but something definitely felt off there. Having said that, the film needs to be applauded for its sheer audacity. For a film-maker who didn't just write and directed the film, but also animated, edited and partially produced it too, "Suffering Of Ninko" is a home run. It's one of those films that cater to a specific niche of audiences who will definitely hail it as a cult in the making. On the other hand, Niwatsukino Norihiro gets an instant approval for his vision and creativity which hints that bigger things are in store for him.